IslandWalk at West Villages offers an amazing swimming pool perfect for relaxing on a warm Florida afternoon. Those who relocate to The Sunshine State can look forward to a sub-tropical climate complete with native palms and hot, sunny weather. This climate makes Florida a great place to cool off with a swim. Most Florida active adult communities feature sparkling swimming pools with relaxing spas and spacious sundecks. Outdoor swimming pools are also a great way to enjoy the beauty of Florida while exercising. Swimming is a low-impact activity which is great for building strength and burning calories without putting pressure on your joints. Water aerobics takes the activity even further with special exercises designed to use both the buoyancy and resistance of the water for a great workout. While most Florida active adult communities offer lovely outdoor swimming facilities, here are 10 to get you dreaming of your Florida retirement by the pool. Heritage Isle – Set along the Space Coast, in Viera, Heritage Isle’s many amenities include a fabulous outdoor pool area. The pool’s spacious design features both a large, free-form area for more relaxed swimming and connected lap lanes for exercise. IslandWalk at West Villages – In Venice, IslandWalk at West Villages features a heated lagoon-style pool ringed by an open sundeck and stately palms. The community also has a separate heated lap pool, which is ideal for its water aerobics classes. Sweetwater by Del Webb – Active adults in Jacksonville will find great places to swim at Sweetwater. This mid-sized Del Webb community features a large resort-style outdoor swimming pool as well as an indoor lap pool and spa. The Plantation – Although The Plantation is open to residents of all ages, this Fort Myers community is a great location for active adult retirees. The community offers two clubhouses, Bridgetown Hall and Somerset Hall, each with their own outdoor swimming pools. The resort-style pool at Del Webb Ponte Vedra is beautifully landscaped with towering palm trees. 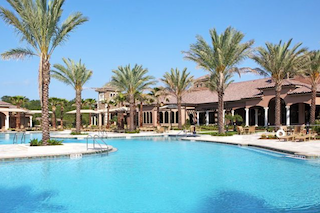 Del Webb Ponte Vedra - Just minutes from the Atlantic Ocean is Del Webb Ponte Vedra offering gated 55+ living with world-class amenities. There is a huge outdoor pool with a large sundeck surrounded by lush landscaping including towering palm trees. Lely Resort – In Naples, Lely Resort impresses residents with a spectacular lagoon-style pool complete with waterfalls, a sand area, a spacious sundeck, cabanas and a Tiki bar with poolside service. There is also an outdoor lap pool where aqua fitness classes are held. Stone Creek by Del Webb – Set in Ocala, Stone Creek is an amenity-rich Central Florida community. Its impressive outdoor swimming pool features both lap lanes and a freeform area with beach entry. There is also an indoor lap pool, and relaxing spas both indoors and out. 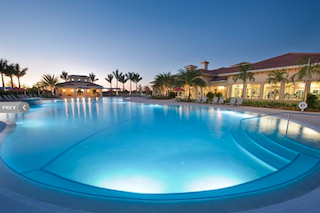 Del Webb Naples – In Southwest Florida’s Ave Maria, Del Webb Naples residents can enjoy a variety of water-based activities in the sprawling waterpark resort pool. Freeform areas are great for a relaxing swim, while specialty sections include lap lanes and water volleyball. Paseo – Surrounded by lush palms, the freeform pool at Fort Myers’ Paseo is a perfect spot for swimming or other aqua fitness activities. The resort-style pool also includes a spacious sundeck, private cabanas and a Tiki bar with poolside service. Trilogy Orlando – In Groveland, just 30 minutes from Orlando, Trilogy Orlando’s amenities include an impressive outdoor pool which also connects to the clubhouse’s indoor pool. This fabulous design features both lap lanes and freeform areas for more relaxed swimming. Whether cooling off with a relaxing swim or staying in shape with water aerobics, these spectacular swimming pools are a great way to enjoy the beauty of sunny Florida.